Several years after the events of Silent Night, Deadly Night (1984), Ricky (Eric Freeman), brother of the original Santa Claus killer is in a mental hospital. After recounting his brother’s adventures (at length), Ricky goes on to talk about his own issues, an intense anger at the color red in particular. Despite having been taken out of an orphanage when he was a child, and given to a good home, Ricky finally snaps and starts punishing the “naughty.” This is what landed him in the hospital. Ricky realizes he must do what his brother failed to accomplish, hunt down and kill the woman to blame for Ricky and his brother's psychosis, Mother Superior (Jean Miller). Silent Night, Deadly Night part 2 was made for $100,000 and originally conceived as a cheap cash-in that would merely be a reedited version of the original film. The first forty minutes of the movie is almost entirely footage from Silent Night, Deadly Night with occasional interruptions from Ricky and his psychiatrist, Dr. Bloom (James L. Newman). I shudder to think how forgettable and awful an entire film like that could have been. Thankfully, director Lee Harry had other ideas and decided to flesh out Ricky’s story despite the minuscule budget. 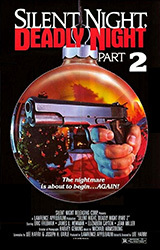 It is at this point that Silent Night, Deadly Night part 2 earns its cult film credentials. "No, it will be fine. 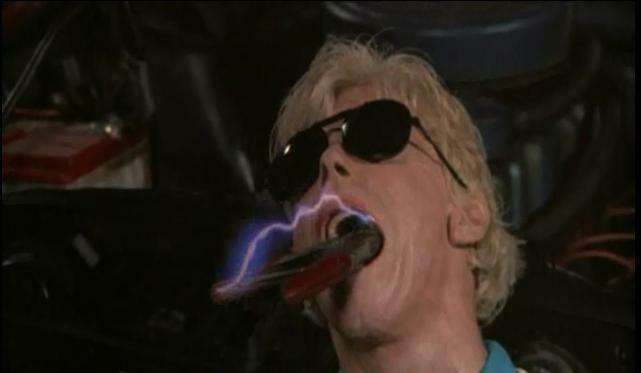 I saw this in Buckaroo Banzai once." Once out from under the shroud of rehashed footage, we’re treated to young Ricky’s adventures. 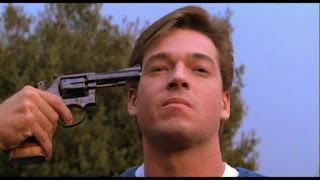 It’s really just a series of vignettes in which Ricky tries to lead a normal life, loses his temper and punishes someone he considers “naughty.” The film loses almost all of its Christmas trappings, but gains a weird sense of humor in the process, from the sight of Ricky teleporting in to kill a loud movie goer, an umbrella impalement, a decent car stunt, and the now infamous ‘Garbage Day’ moment, Silent Night, Deadly Night part 2 suddenly becomes a lot of fun. Once the movie swings into its final act, it turns into a more traditional sequel. The finale is an extended indoor chase with a Santa suit clad and axe happy Ricky versus the now strangely mutated (more likely than not to hide the fact a different actress is playing the part) and wheelchair-bound Mother Superior. It’s not exactly Hitchcock level suspense, but it is competent enough to hold the viewer's interest. As with any slasher movie worth its salt, it all ends on big question of whether Ricky has been put down for good. When your best movie is Murder Weapon. Silent Night, Deadly Night part 2 wouldn’t be nearly as strange as it is without the performance of Eric Freeman as Ricky Caldwell. His over-emoting eyebrows, inability to deliver quips, coupled with his imposing size give him an odd charm that survives even when he is dispatching people who may or may not deserve it. It is an amazing train-wreck of a role. Silent Night, Deadly Night part 2 is a cheap, unnecessary, complete mess of a film, and a terrible sequel to an original that wasn’t that great to begin with it. Yet somehow, through the magic of cinema, this jumble of parts comes together to form an experience you’ll never forget.